Righty pitcher Will Hibbs enjoyed an outstanding 2017 campaign at the Class A level. En route to an All-Star bid with Lakewood in the South Atlantic League, the six-foot-seven 245-pounder posted a 6-4 record with 20 saves, a 1.77 ERA and a .137 batting average against in 40 appearances. 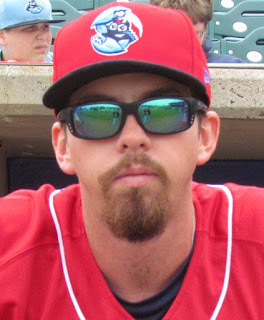 Hibbs, the Phillies' 19th round draft selection in 2016, also earned a promotion to Class A Advanced Clearwater in June, but he returned to Lakewood after sporting a 7.88 ERA in five relief outings. Recently, I talked with the Texas native about his off-season, getting married, encounters with the late Roy Halladay and more. Read ahead for that full interview. -To start, just wanted to ask about the how the off-season began for you. How long did you discontinue throwing and what fitness or exercise do you work on during that stretch? I took about three full weeks off from everything: lifting, throwing, etcetera. I did some body weight and functional fitness exercises about three times a week, just to keep my body active. -Did you participate in any of the clinics or sessions in Clearwater like instructs, the strength/speed clinics? I did not report to Clearwater for any off season clinics. I got married on December 2nd so a lot my time prior to that was devoted to wedding preparation and working. -Wow, congrats! That is big news. Tell me more about wedding plans or prep, if you don't mind. What were you involved in and did you enjoy it? The artsy prep was done predominantly by my wife and our mothers, while I was responsible for getting all my groomsmen’s stuff organized. As for the weekend, it was held on the grounds of a golf course, so I played a lot of golf up until the point of saying “I do”. -Any baseball related aspects at the ceremony or reception? Since baseball dominates the majority of our yearly schedule, we didn’t do a lot of baseball themed things in the wedding. We had some baseball cake balls at the rehearsal dinner, and plenty of pictures of me in uniforms from years past, but that’s about it. -What is the current workout routine and what facilities are you using? I am staying consistent with our organization prescribed workout routine (which includes) similar exercises that we do in season. I am working out at a local gym that my wife and I go to. -What are you doing outside of your workout routine this off-season? Are you holding down a job or working as a coach or instructor at all? I am working part time at a golf course (so I get to play) lots of free golf! I ran a pitching camp throughout November and will do another one in January at one of the local baseball facilities. -What big lessons did you take out of last season that you know will stick with you for many years? The biggest thing I took from last season is to "control the controllables". Things don't always go your way on the mound, regardless of who is at fault, but you have to learn how to recover and keep your team in the game and give them a chance to win. -Several guys have talked to me in the past about being able to get exposure or time with Roy Halladay while he was working as a mental skills advisor down in FL. Did you have any meaningful meetings with him and what did that mean to you? Do you have any noteworthy encounters to share? Every conversation I had with Roy was meaningful. I made it a point to soak up anything he had to say, even it was about how he viewed things off the field. He was the kind of guy that you always wanted to be around; you could always learn something from him. It would be absolutely sinful to not be 100-percent engaged when talking with him, no matter the topic. You could tell he was a fierce competitor in every aspect of life.